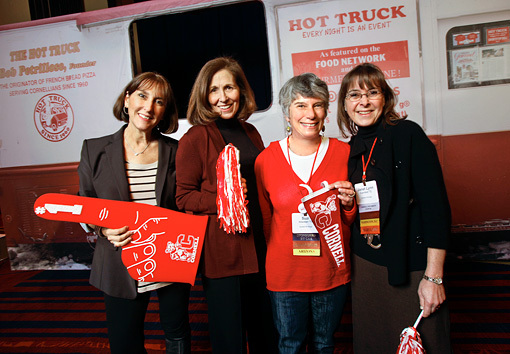 Suzi Hileman '73, second from right, with, from left, fellow Sigma Delta Tau sisters Susan Rosenberg Thau '72 and Ellen Rosenstock Morehouse '72, and former classmate Janet Cornfeld '72 in front of the Hot Truck mock-up at the Cornell Alumni Leadership Conference in Washington, D.C., Jan. 28, 2012. Photo by Jason Koski/University Photography. Suzi Hileman '73 was one of 19 people shot in a Safeway parking lot near Tuscon, Ariz., during a "Congress on Your Corner" event Jan. 8, 2011, held by fellow Cornellian U.S. Rep. Gabrielle Giffords, MRP '97. Six of those shot died, including one of Giffords' staffers and Hileman's friend and neighbor, 9-year-old Christina-Taylor Green, who Hileman had brought to the event to meet the congresswoman. Giffords was seriously wounded and resigned from Congress in January 2012 to focus on her recovery. Hileman, shot three times, continues to recover and undergo physical therapy. She blogs daily at The Burrow, ashleighburroughs.blogspot.com. From far above Cayuga's waters you helped me to heal. You sent boxes of goodies from the campus store, treats I never would have bought for myself. The leather Big Red Bear was a tangible reminder that I was part of something much larger than my living room. Sitting still for 12 weeks, unable to ambulate, my world shrunken to four walls and the novel in my lap, that stitched bear was a touchstone to the outside world. And what wonders fill that outside world. Old friends and sorority sisters found me. Professors and deans and the university president sent me cards and letters. Local alums reached out, sending Big Red get-well wishes, one of which found its way to my room in the ICU. How could I whine when "GO BIG RED!" "GO SUZI!" was exhorting me from the curtain? I could float for hours on the loving words posted at Cornell's Wishes for Our Recovering Alumnae website, knowing that we weren't really strangers -- we were Cornellians. At a time when I felt most isolated, I could feel Cornell "reared against the arch of heaven [looking] proudly down." 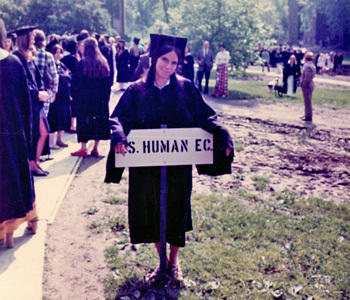 Suzi Annis Hileman about to graduate from Cornell's College of Human Ecology on Commencement Day, 1973. Photo provided by Suzi Hileman. That pride filled my soul. You were honored to have me in your midst, and I was thrilled to be there. You saw me as brave, as courageous, as resilient, and I chose to believe you. You saw the larger picture, the Cornellian-turned-congresswoman, the alum holding the hand of an aspiring member of the Class of 2024, the passing of the torch. You knew that I would recover, that I would thrive, that I would grow and flourish -- I was, after all, a Cornellian, just as you were. We may be "centrally isolated," but we are involved. Cornell was a big part of my adventure with Christina that sunny Saturday morning. There was no reason in the whole wide world that Christina couldn't grow up to hold her own Congress on Your Corner event someday … and she knew it. Cornell's land-grant mission, taking the research to the people, appealed to her sense of justice and fair play. It seemed only right that what was learned in the academy should venture forth and serve the community, and Christina was all about community. It's what we were talking about when the bullets began to fly. That sense of community stayed with me in the weeks and months afterward as I planned for my own future, seeking a way to honor my friendship with that very special little girl. Again, the university came to my rescue. A not-for-profit emerged, flowing naturally from the work I did as an undergraduate in human development in the early 1970s. 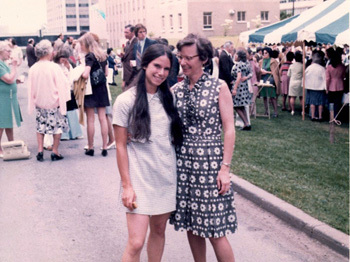 Suzi Annis Hileman with human development professor Ellie Macklin near Martha Van Rensselaer Hall during the College of Human Ecology's reception following Cornell Commencement in May 1973. Photo provided by Suzi Hileman. Professor Ellie Macklin encouraged us to bridge the gap between our high school experiences and those of the Teen Tutors with whom we were paired -- setting me on a path from which I've never wavered. I have always had much older and much younger friends. I was always surprised that others did not. The events of Jan. 8, 2011, provided me with a platform; Cornell provided me with the program. Intergenerational mentoring, bringing together those who have time with those who have need, bridging the public/private chasm, harnessing the energy of those who volunteered "where I used to live" but who found themselves unanchored in a new community, filling the gaps where parents and families cannot, GRandparentsINresidence (GRIN), grandparentsinresidence.com, provides a home for those with skills honed over years of creating PTA teacher appreciation luncheons, coaching youth basketball teams, reading aloud. Years of doing the things that grown-ups do to make the world a better place for those who will follow us need not stop because the local school principal no longer recognizes you. GRIN paves the way, training and vetting volunteers, locating resources and pockets of need, connecting and analyzing and continuing the mission I shouldered upon graduation. We are connecting classrooms in Ithaca to classrooms in Tucson, college students challenging middle schoolers to stretch their wings and aim for the stars … or, perhaps, Cornell. We are researching and studying and documenting, just as I learned to do decades ago on the Hill. Some things stay with you forever. I'm finding that, for me, a big part of that is Cornell. We are part of a remarkable community, you and I. Intelligent, engaged, passionate and caring -- you shared all that, and more, with me when I needed it most. Now it is my turn to pass on the passion. Thank you, each and every one of you, for helping me on my way.